I’ll take a “resurrection machine” over a “tomb” any day of the week (trivia – a week on the ancient Egyptian calendar was 10 days long). 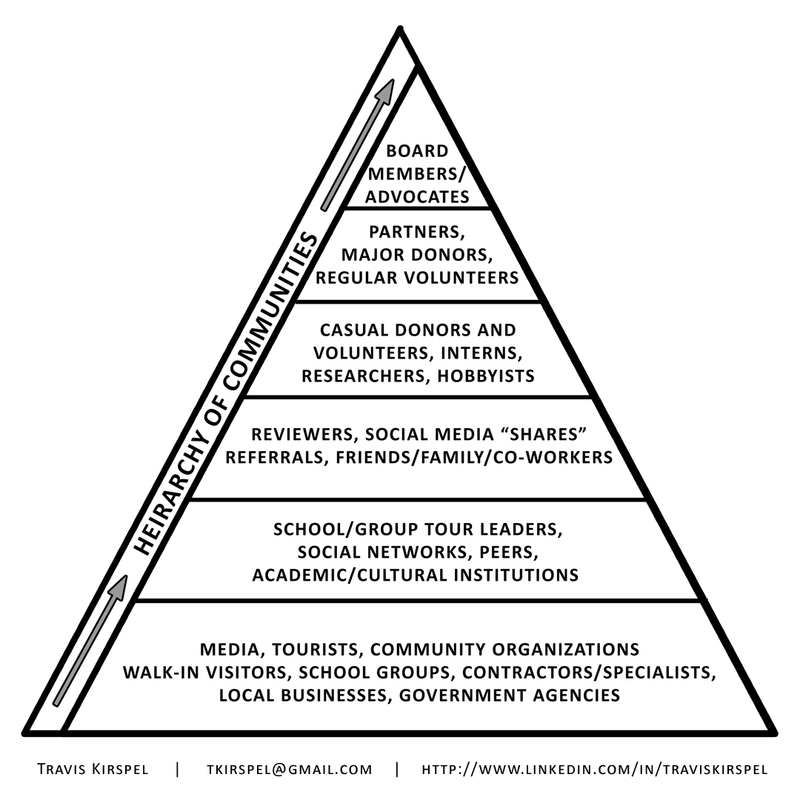 I’ve spent many Egyptian workweeks in recent years working on a pyramid that can help to inform and optimize an organization’s engagement initiatives through more effective and sustainable community relationships. My first “close encounter” with Maslow’s Hierarchy of Needs was in an undergrad psychology course. I was both intrigued and slightly crestfallen to find that I was not as distinctive or enigmatic a butterfly as I had come to believe. When it comes to psyches, we are all ad hoc upgrades from the same base model. I filed it away in a mental drawer that grew dramatically in those years as my liberal arts education continued in a steady onslaught of shock and awe upon my delicate inner butterfly. That was the last I saw of Maslow or his Hierarchy until I attended a session on Effective Volunteer Management at ALHFAM’s 2011 Annual Meeting & Conference. The speaker was Dr. Patrick Nestor, an Extension Specialist – Volunteer Leadership, at West Virginia University. Dr. Nestor covered a lot of ground and provided concrete advice with practical tools. Prior to this session, I had never thought to use terms like “scientific” and “systematic” to characterize volunteer management. However, previous experiences honestly hadn’t led me to use words like “effective” in the same context either. Volunteer management is hard. Management is hard. Relationships are hard. They all really require a systematic approach in order to be truly effective. And that’s hard! One tool that Dr. Nestor recommended as a starting point to make all of these things a little easier was Maslow’s Hierarchy of Needs. It’s easy to fall into the trap of viewing our relationships (both personal and professional) in terms of what they represent – dollar signs, volunteer hours, visitation numbers, information, comfort, love, work, etc. That’s not necessarily a “bad” thing. We are, after all, human and we do, after all, have little control over our own mental associations. We can use tools like Maslow’s Hierarchy to, as silly as it sounds, humanize the people in our lives, as well as in our museums and businesses; then identify opportunities to make those relationships more sustainable. I’ve taken some time over to mull this over. If I were to create a universal tool that could strengthen relationships for (or between) any individual or organization… what would it look like? How would it work? In psych class, I learned how Maslow’s Hierarchy relates to the individual. In Dr. Nestor’s short conference session, I learned how the Hierarchy relates to the community. We all have needs. Our relationships are not immune to and, in fact, are dependent upon those needs. We relate to each other through Maslow’s Hierarchy. For the purpose of our pyramid, Maslow’s Hierarchy of Needs serves as the “primordial mound” from which our world of engagement is created. On the organizational level, the Hierarchy should dictate how your institution interacts with its staff, partners, communities, and audiences. Are you having trouble attracting or maintaining staff or volunteers? How’s your Hierarchy? Many people will find another opportunity before they vocalize their needs. Most will decide they are unhappy and move on before trying to understand or articulate why. The onus is on you to address their psychological needs or find a way to meet your own organizational needs without them. There is an important proviso to keep in mind when working with the Hierarchy – no shortcuts. That’s why it’s a pyramid. You can’t fulfill Love and Belonging without fulfilling your Safety and Physiological needs. Doctors would characterize this as “imbalanced” and policymakers would describe it as “unsustainable.” Ergo, someone who has fulfilled their Physiological and Safety needs has a healthier psychological standing than someone with an abundance of Love & Belonging. Now put it in terms of you and your organization. Can you think of any people or organizations who have a pattern of trying to put Self-Actualization and Self-Esteem before their Safety and Physiological needs? How do you think it’s working out for them? 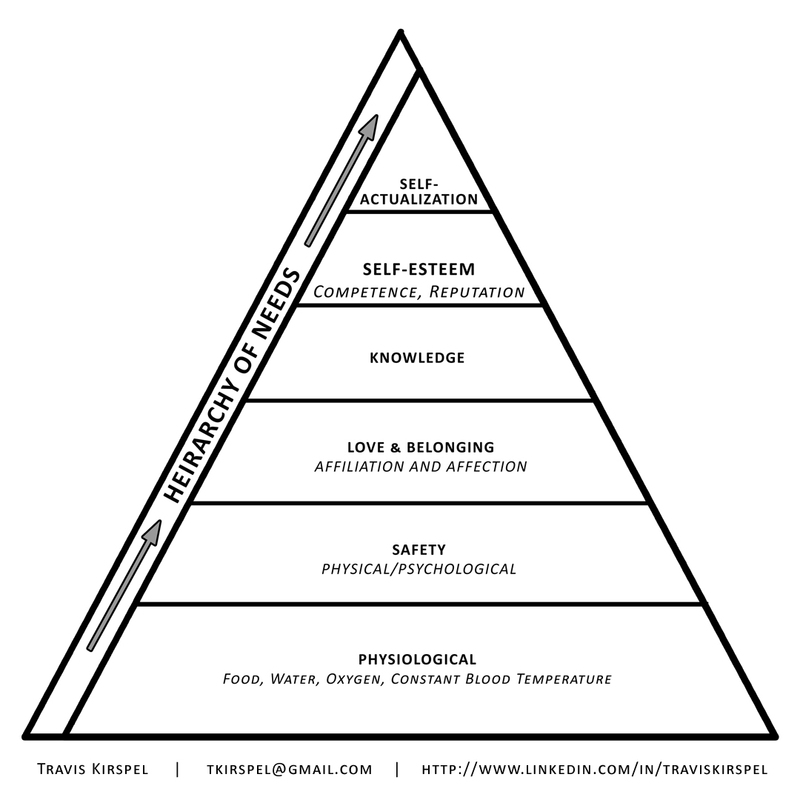 Maslow’s Hierarchy is the tool and Nestor’s Theory is the context. Now we need an owner’s manual. We need guidance on how to use this insight. 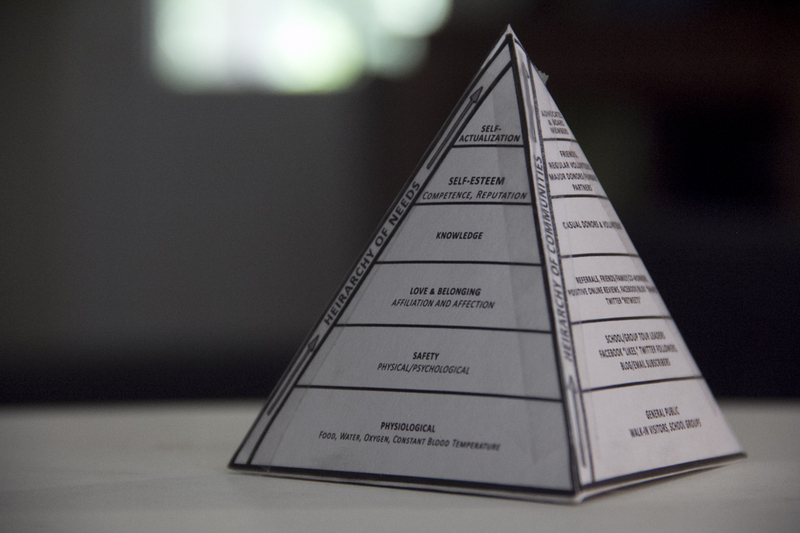 Before sadly going defunct in 2012, Groundwire developed a phenomenal Engagement Pyramid. Fortunately for us, the Pyramid has endured through other industry blogs (idealware.org), but I encourage you to visit and capture the information before this, too, disappears into the ether. 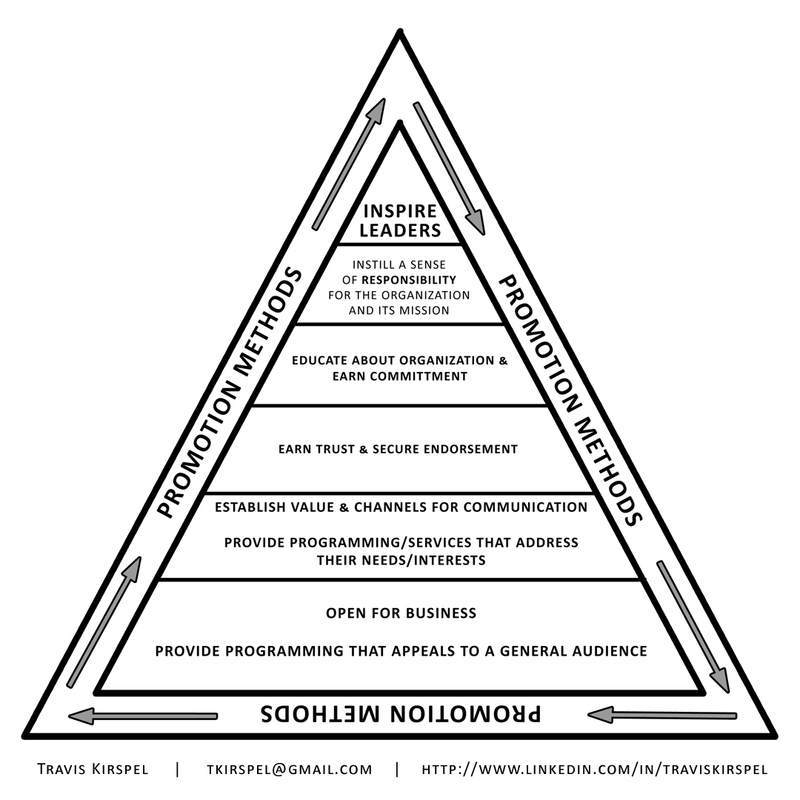 Groundwire’s Pyramid provides a straightforward user-friendly engagement methodology. They’ve identified primary engagement goals, the mindset of the person being engaged, the nature of the engagement, the types of communication, and metrics and examples associated with each of their six levels of engagement. I would also recommend checking out Groundwire’s 10 Rules of Engagement, which has survived in the form of a guest blog post at the Sales Force Foundation. Now we have a tool, a context, and a framework. How do we know if we’re doing this right? How can we use it to set goals for your organization? For this, I’ve put together a Hierarchy of Communities. This helps to put a face to the engagement, This tool identifies where your current audiences and communities fall on the spectrum and what groups you want to recruit from to fill certain voids. If you enlist volunteers directly from the general public without taking steps to establish a sense of trust, security, and belonging, you will not have sustainable relationships. This helps you to target audiences that have a solid foundation for the level of engagement that you ask of them. This also helps you to shape achievable goals for your organization. You can’t make every visitor into an advocate or board member for your organization. Nor do you want to – the higher you take someone up the Hierarchy of Needs, the more that relationship demands of your organizational resources. The Hierarchy of Communities shows us what balanced and realistic engagement expectations might look like. We have a tool. We have a context. We have the means and we’ve defined an end goal. Now the only question is how exactly are we going to get there? The pharaohs weren’t launched blindly into eternity and our objectives can’t be thrust indiscriminately into our communities. We need to map our course(s) of action. I would also recommend the Digital Engagement Framework as an additional resource for identifying and strategizing your organization’s engagement opportunities. Don’t let the “digital” fool you. This is just as relevant with “analog” communities and you’ll find that there’s a growing degree of overlap. In fact, I highly recommend integrating your engagement frameworks in order to maximize impact and minimize redundancy. You’d be surprised what you can accomplish with a hybrid approach. If you’re like me, you need something tangible to stare you down on a daily basis and motivate you into change. Change is hard (like management and relationships)! You also need something hands-on to help your mind synthesize the big ideas. 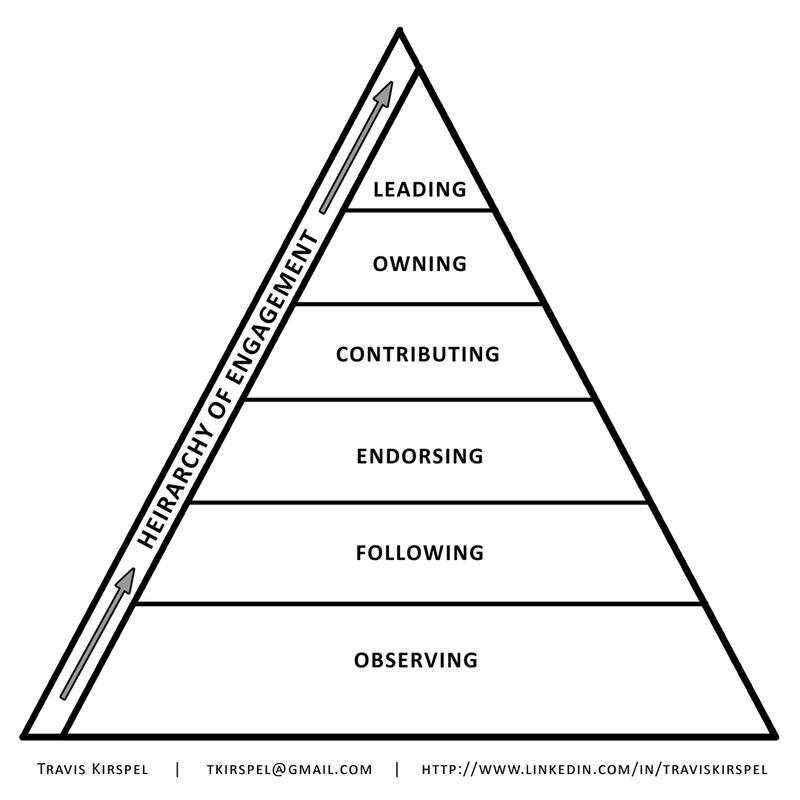 That’s why I’ve put all of this together in an easy printable arts and crafts project (pdf of the Pyramid of Engagement). 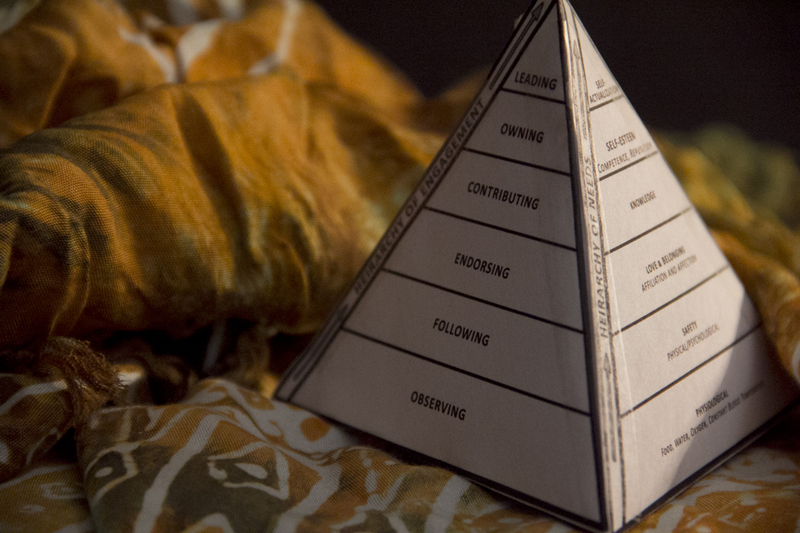 All you need are some scissors and scotch tape and you, too, can have your own personalized 3D Engagement Pyramid. Crayons or colored pencils can spice up the project even more while working wonders for your expressive inner butterfly. I’ve left the Promotion Methods blank for you to fill it out with your own solutions before you put it together. Keep it on your desk or hang it from your ceiling as a reminder of all that it represents. In the years since my undergrad psych course, I’ve found that we are all special butterflies. There’s just a fine print – there are more than 7 billion special butterflies just like us. It turns out that being special isn’t really all that special. Do you know what the butterfly meant in ancient Egypt? Absolutely nothing. It was just pretty. The dung beetle, on the other hand, was chosen by one of the most powerful civilizations of the ancient world to represent a sun-god. Am I suggesting that you want to be a dung beetle? No. I am suggesting that you want to be more than a pair of pretty wings if you want to make an impact in your community. We have a lot to learn from the Egyptians. Any given museum is one of more than 17,000 of its kind in the United States. Those museums are adrift in a sea of 41,190 Arts, Culture, and Humanities organizations registered with the IRS. They all belong to a population of more than 1.5 million non-profits vying for volunteers, talent, funding, and attention. Given these statistics, organizations can’t afford to not be unique. Given the limited pool of resources that these millions of organizations have to pull from, they cannot afford to not be human either.